We appreciate everyone who participated in the RebirthM OBT, which was opened on July 17, 2018. 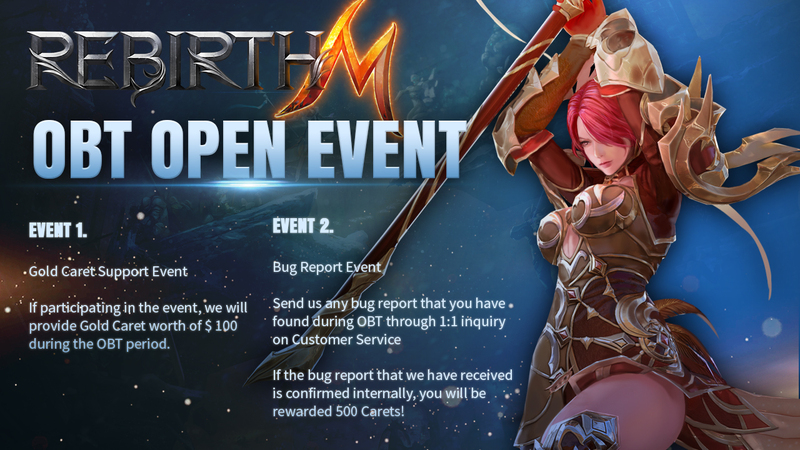 Please check out the information below for details about OBT. ■ Event Period(PST) : 2018.07.20 (Friday) ~ Until OBT period ends. ■ Description: If participating in the event, we will provide Gold Caret worth of $ 100 during the OBT period. If the bug report that we have received is confirmed internally, you will be rewarded 500 Carets! ■ Reward Distribution Date: Rewaded as soon as the bug is verified. 1. Please be sure to include your character name when you participate in the event. 2. Please provide and attach a screenshot of details of the bug. 3. If you send contents that do not match with the event requirements, you will not be eligible to participate in the event. Again, thank you very much for your participation and interest! We hope that all of you will have a good time with RebirthM during OBT! All of yhe rewards wont carry over to Offical launch?